Ayurveda, which literally means the “wisdom of life” is the ancient holistic science of India which utilizes the valuable properties of each plant, root, herb, flower and mineral to maintain and restore one’s natural health and well-being in harmony with the rhythms of nature. 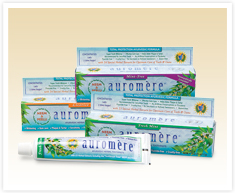 Auromere’s unique formula of tooth pastes combines 26 potent Ayurvedic botanical extracts and essential oils that for centuries have been esteemed for optimum care of teeth and gums. The formulation is concentrated, requiring less usage per brushing, so one tube lasts 3 times longer than most other brands of toothpaste!